Rick Nillsen walked half-way across the Hennepin Avenue Bridge clutching a business-size envelope against the chill October breeze. 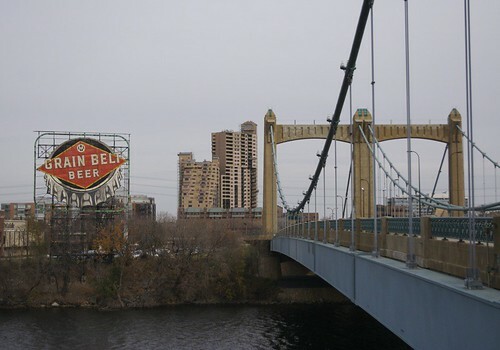 He walked the bridge all the time, often stopping in the middle to take in the sweep of the Mississippi toward St. Anthony Falls. Even with the traffic hurtling by it was a peaceful spot, a place to gather his thoughts and find his balance. But today it was all different. Rick’s entire life was different thanks to the arrival of the envelope. Nothing more than that. Nothing more was needed. Rick looked at the photos: he and Dana leaning against the hood of the Dodge, he and Dana by the Spoonbridge and Cherry statue in the Sculpture Garden, he and Dana in front of the Christmas tree, Dana smiling on the stoop, Dana as Mary Tyler Moore tossing her beret on the Nicollet Avenue mall. He fingered the pictures, and read the note again. And again. And again. And it was all so true. They were so damn happy in those pictures. And it was a lie, like all photographs. Nothing but a snippet of life, with no context at all. Not that we intentionally lie when posing for the snap of the shutter, but the moment captured is nothing more than the surface view. There’s always much more going on below the surface. He thought of his favorite picture of himself with his dad, taken just after tossing a football around in the snow, both of them beaming smiles and happiness. But dad probably already had the Hodgkin’s that would take his life when that photo was taken. And maybe he knew it as they were tossing the ball around. He thought of the one with dad and mom, taken on New Year’s Eve, mom rosy and glowing and tipping her Martini glass. There was one drink in the picture, but Christ only knows how many she had that night. He thought of those moments captured in the Polaroids in his hand. Dana was apparently never happy with him, so it was all a lie. When a relationship ends, a life ends. Everything ends. Routine, pattern and repetition, comfort and security. Everything familiar and needed comes to a sudden, sickening end. And nothing will ever bring it back. Dana is gone. My life is gone. Wow! Glad I’m a friend of Paul Hilcoff’s on Facebook, so I could see this! Just added you to my list of blogs I like to read. Looking forward to reading more when you post! Holy! I’m so honored to have you here! Paul is a good egg, so you obviously are as well. 😉 Funny: this one came to me wholesale in about an hour last night, and I just took the 2145 and applied it to Nicollet Ave. Totally forgot that that was the office address. Nice accident, I guess. G seems to be pretty chill about such things, so long as no one’s making money off it. 🙂 I.e. — don’t ask him about “Spot’s Arcade,” or let him know you have a copy, (if you do in fact have one). My blog is mostly about my knitting and spinning these days, and there are probably WAY too many entries about G, but really, our friendship is one of the great joys of my life. I am a would-be novelist who has done a lot of writing, and finally gave up on the mainstream publishers and self published via iUniverse in their early days. Now that they have caught on, they are too expensive for me, so I’m exploring the possibilities of Kindle publishing. It’s free at the moment, though I suppose when that medium catches on, a price will be attached. I met Paul through G in Cambridge in September 2010. Totally serendipitous occasion — I saw Grant in the restaurant, walked up to say hello and give him some gingerbread I made for him, and hubby and I were promptly invited to join G and Paul for dinner. It was a lovely evening, and G’s show afterwards was fabulous. He opened with “Awake, Arise,” and it was the first time I had ever heard it. Made the hairs rise on the back of my neck as soon as I realized the chord progression was unfamiliar, and therefore, it MUST be something new. Oh, trust me: nobody is making a dime off this page. Great stories! Keep ’em coming! Good gravy, this is intense. I’m going to relax with a bottle of gin and watch some cartoons now. Love this text, the thought of a relationship as a life, a road, and when it ends it all stops, takes a new turn. Love the feeling I get while reading this. It’s sad but somehow it reminds me of that kind of pain that has to come before you can feel better. Great photo as well. Thanks! As always you draw me in and force me to re-read at least once for the nuance. This was so textured and bumpy. I could see the pictures and the bridge (I have driven across that bridge!). Wonderfully done, I have looked at those pictures of finished relationships and thought ‘over’ and ‘all lies’. Thanks so much, V! Yeah, it’s pretty raw stuff. Guess we’ve all been there. THis is so good Westbye. Makes me think of Shakey and how it might all be lies. We’re actors on the stage, acting like we think we should accordin to the setting at hand. Really makes me think, and that is what it is all about. Great stuff. Thanks so much, Rook! You are so correct, and now I’ve got some fuel for thought.